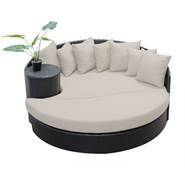 Perfect for snuggling on clear summer nights, our circle design is ideal for furnishing balconies at patio parties and dinner events. Note: The fabric color chosen may ship separetely depending on availability. The cushions automatically ship in "Wheat", and the color selected here is for the cover of the cushion. Designed for comfort and timeless style. Deep seating proportions maintain a contemporary low profile while providing comfortable back support. 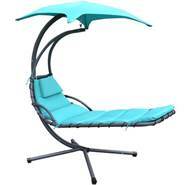 Made from all weather, hand-woven, polyethylene resin wicker, over strong but lightweight powder coated aluminum frame. UV, weather and fade resistant. Holds up great in salt and chlorinated environments. Perfect for coastal living. Plush cushions are constructed from high density layered foam. 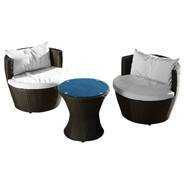 Seat cushions feature breathable, mesh bottom panels for quick drying. All cushions and pillows wrapped in acrylic, thread dyed, Sunsharp, all weather, fade resistant fabric. One year manufacturer's limited warranty. 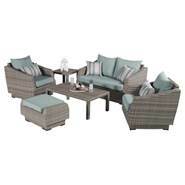 The perfect spot for cocktails and conversation, this all-weather wicker seating group makes a splash poolside or on the patio. Complement its crisp white cushions with striped pillows and a vibrant area rug, and then set a tray of crudites on the cinched end table for guests to snack as they chat.